In July's edition of My Month In Words I talked about the fact I'm attempting to transition to a plant based diet. If you follow me on Twitter you've probably seen me ask an abundance of questions and complain about some of the difficulties I've come up against. I think I underestimated how difficult this process would be for someone with as many food aversions as I have. Texture, colour and taste are all big factors when it comes to whether or not I'll be able to eat something. This isn't merely a 'picky eater' thing. It's something I've struggled with for a long time and has had a major impact on my diet, appetite and health. Prior to attempting this change I largely lived on around five staple foods. Almost all of which were meat and/or dairy based and unhealthy. These were my safe foods. Foods I could count on when my appetite was lacking to give me a boost in calories in a relatively small meal. Small calorie packed meals are important because I find it hard to eat large volumes of food. One of the pros I keep seeing about a plant based diet is that you're allowed to eat a lot more because you need to eat a lot more, which is great in theory but not so much when that's something you struggle with. I'm by no means saying you can't have small calorie packed meals when eating a plant based diet, I'm merely saying I've struggled during this transition but I'm also still learning. All that together has made the transition particularly hard. At the minute I'm just about breaking 1000 calories a day if I really try. I'm eating all the things people recommend. Rice, beans, nuts etc. As I only weigh approximately 4 stone 8 to 10 lbs, it's important I don't allow myself to lose any weight. I also can't afford to develop anymore food aversions by forcing myself to eat to up my calorie intake. Further than that, I'm aware that making food such a central thing as I am right now could also be damaging to my appetite and I have to be mindful of old behaviours such as food avoidance and withholding food creeping back into my life. Now, I know you're probably thinking this seems like an anti-plant based diet post or that I seem like I'm making a bunch of excuses as to why I'm going to ditch the whole endeavour. You might even think I seem ignorant about the whole thing, in which case I'm open to education on the matter. Please do give me advice in the comments! BUT that is not what this is. I think a plant based diets and veganism in general are wonderful things and I'm by no means ditching it. I'm merely discussing the reasons I've personally struggled with the transition so far. So you're probably wondering what I'm doing. Right now I'm working on broadening my diet. I'm tackling my aversions and attempting to try new foods. I'm trying to work through intrusive thoughts about textures, colours and tastes while I eat but avoiding really forcing myself at the same time. I'm incorporating vegan safe foods and more fruit and vegetables into my diet, trying to be more healthy while being mindful of the fact I need to keep my calorie count up. That sometimes means I need to eat conveniently or whatever will give me the biggest boost of calories without making me feel sick. I'm taking any and all advice on foods to try and tips on maintaining a plant based diet. Most of all, I'm not beating myself up when I slip up because this too would be dangerous to my appetite. I won't risk forgoing food if vegan friendly foods aren't available to me. I've significantly cut down on meat and also animal products in general but I've not cut them out entirely. The reasons for that are partly to do with what I've mentioned above but also because many of my meals are prepared at my parent's place and while they have been as supportive and accommodating as possible it isn't always possible. I'm not going to beat myself up for that. I'm hoping that when my kitchen is adapted and more accessible that will help a lot as I'll be able to prepare more food myself. 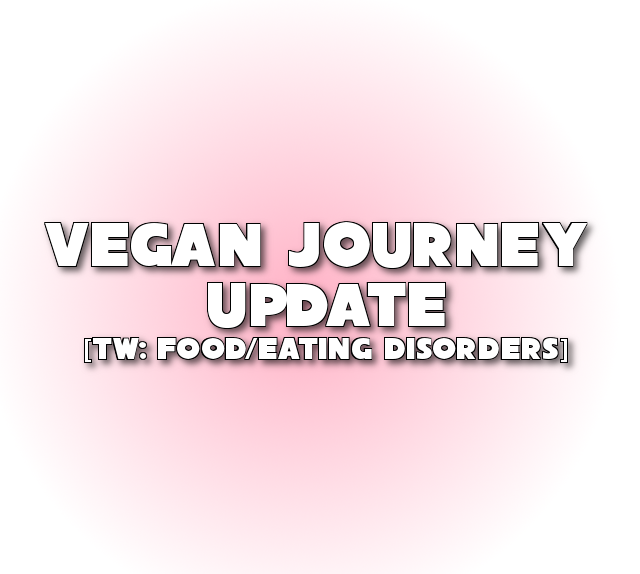 I have a vegan foods related post coming up next and I felt like before that I wanted to give a little bit of an update on how I'm doing with this change to my diet. I was going to include it in the vegan foods haul but decided to go a little more in depth and because I discussed some potentially triggering stuff I didn't want people to have to avoid a food haul because of it. As I said, if you have any experience with this stuff please do give me any advice in the comments. Especially if you have any of the same issues I have as it's kind of hard to discuss this stuff people people who have a good appetite and are average in health and body weight. I'm not dismissing those people's input and still welcome it though! Disclaimer: I've added an eating disorders trigger warning to this post as I discuss behaviours and issues associated with eating disorders. I've never been formally diagnosed with an eating disorder and this is not a self diagnosis, I'm just aware that this post may be triggering to some.